1980: 2nd year of the programme at the Chichester College of Technology. In our first year of the Film Society founded on the 20th September 1979, I programmed Woody Allen’s ‘Love and Death’ on 16mm, which we are celebrating with a screening and a party on Friday 20 September 2019. 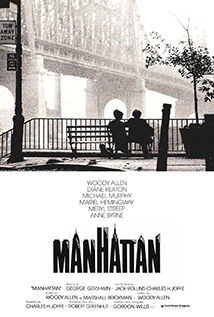 In the 2nd year of our Film society, we opened with another newly released Woody Allen classic Manhattan (1979). – Roger Gibson. Nominated for two Academy Awards, and considered one of Allen’s most enduring accomplishments, ‘Manhattan’ is a wry, touching and finely rendered portrait of modern relationships set against the backdrop of urban alienation. Sumptuously photographed in black and white and cinemascope (Allen’s first film in that format) and accompanied by a magnificent Gershwin score. Starring Diana Keaton, Mariel Hemingway and Meryl Streep. Originally shown on 16mm in 1980 now presented digitally with superior sound and picture.